Atlas U.K. trucks collection "When will they stop ?" A few months ago, some Leyland Octopus tankers arrived from China via various ways. Today the collection is launched officially. I must warn possible subscribers to this collection that since last summer Atlas Editions have turned mad. I must warn possible subscribers to this collection that since last summer Atlas Editions have turned mad. • The unpolite management is part in Paris and part in Lausane. • The collection manager is in Aix les Bains in Savoie. • The shipping department is in Cavaillon in the south of France, they ship the models in random order and dates in unsealed boxes, the postmen do make their collection at your expanses. • The customers dept. is in Casablanca in Moroco. • Since last summer, the manufacturing is made by a new Chinese manufacturer and the quality has fallen down drastically. and these departments do not communicate together. So as usual, Buyer beware. Re : Atlas U.K. trucks collection "When will they stop ?" Although these Atlas Dinky Toys are received when available, ie not in any order that relates to the 'Article number', most will have received about 40 by now and unfortunately that includes lots of the French ones, which some collectors may already have had. In fact the only castings unique to the the UK series are Mini Countryman, Bedford CA van, Morris J van, Ford Zephyr, Austin Atlantic, Morris MO; so much for British Dinky Toys. The same seems to be inevitable with the Trucks, the Leyland, Guy Warrior, TK castings, maybe a Guy Otter as this casting exists in Dan Toys already, then a load of regurgitated French issues. No wonder the duplicating DeAgostini series was abandoned. I like the occasional Continental or American car but can only take so many Simcas and Berliet. On Friday the latest issue of the Atlas Editions arrived on the doormat and this time, yes as usual, it is a French Dinky Toy casting; 24L Peugeot 304 Taxi. As usual the quality of the finish is very good and one small shove sends it hurtling all the way down the hall floor. I don't remember the originals ever being this nimble on their axles. Having said that, I don't ever remember French Dinky since I don't remember seeing them in UK shops and never knew anybody who owned any. They are hardly plentiful at UK toy fairs even these days. Were it not for Atlas, there probably never would have been more than a fleeting fragrance of French Dinky Toys in my toy cupboard. Like a lot of other people, I bought a few from France or Hong Kong before the UK offer began. Luckily there hasn't been much overlap - or if there has, the models are usually in different colours. In no particular order, this is a list of Atlas Editions UK subscriptions to date (as well as I can compile it). Al---They have certainly reproduced many classic models, and hopefully revived some interest in the diecast hobby. And the Dinky Peugeot 304 was never produced in Taxi version by Meccano!! Quite a few Peugeot Taxi's have been sold through vectis. Colours are dark blue and yellow or maroon and cream. All pre war with solid mazak wheels. Atlas are big on rarity models so I would guess they have been advised by someone who is steeped in the most obscure and elusive french model. Probably someone like Jean Michel Roulet since he is the go-to guy for french dinky as the most published authority on the subject. The Peugeot Taxis produced by Meccano were the "402" and the "404"
You're right Richard - I have no idea where I got 304 - of course I meant 402 . These keys are so close together. Yes, it's nice and the atlas is a very nicely made copy of it. I don't think the originals had them but the chinese replicas have a baseplate and peened axels. Same thing with their Hotchkiss and Mercedes also having peened axles. At some stage I might break them out and install crimpers instead. Al.....all of my early post war French Dinky's, such as the Citroen 11BL and the Ford a Trucks, from around 1949 or so, all have peened axles....not crimped. I just noticed that recently, so am now wondering if and when the French used the crimp style. And like a lot of other Dinky items, makes you wonder how/why the French could do it much earlier than their English counterparts. Another thing the French did differently was keeping rear windows in the cab of trucks, again such as the Ford 25 series. It appears that the English couldn't get rid of those pesky small windows quick enough after the war. Crimped axles are such a distinctive feature of early Dinky Toys that not to copy that into the replicas makes for a conspicuous difference to the character of the objects. That French models did get into peened axles earlier than UK ones is probably true but I'm not aware that models like Auto Union, Mercedes, Hotchkiss, Peugeot 402 and Triporteur were anything other than crimped and had mostly been deleted before the tool came into use. Just for fun, here are a couple of atlas auto unions - the one on the right I've cut the original axle off and swapped it for a crimped new one. The copies of the Guy Lyons and Slumberland vans put out by Dan Toys both used the grooved hubs but, of course, the later Ever Ready, Spratts, et al, used grooved hubs. The Weetabix livery might have even started ridged then changed to grooved, so maybe it isn't completely inconsistent with the originals for the copyists to take a little liberty there. But an auto union without crimped axles? Too much of an innovation to overlook. Bafflingly, the atlas copy of 23a has crimped axles. So it isn't like they can't do it. The latest arrival in the Atlas Editions Dinky Toys large scale series is the Guy Lyons Van which was also offered by Dan Toys last year. Unlike Dan, Atlas have used ridged rather than grooved hubs and the type 1 cab. In fact, these copies are different casting altogether - which would suggest there is no connection between the two companies even down to the sourcing level. While both are very good replicas, Atlas wins points on this occasion for more scrupulous attention to getting all the details right and including the correct box style. While I'm still on the subject of Atlas Editions, here's a comparison of their Ford Zephyr with an original. As with most of their offerings, Atlas get a really immaculate finish on this copy. The colours are a very close match to the original two-tone and the casting details are quite faithful. The main difference is that the copy has acquired a thin beading trim around all the windows. Perhaps this is a tactic to reduce flashing or some other moulding consideration. But seeing one or two ragged windows in a casting is such a characteristic of the original toys that it actually detracts from the period authenticity when all these imperfections are eliminated. But still it is a pretty good replica with no visual difference when seen from a few paces back. It's a pity that the box is a let down. To fit a plastic packing piece and a wad of tissue paper, the box is deliberately outsized. The young me was always somehow impressed that every car fitted inside its own box so perfectly. 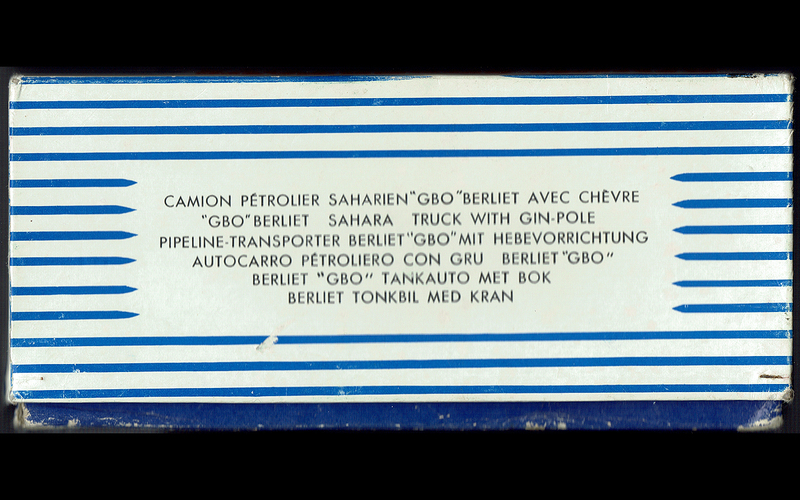 It also doesn't help that Atlas have slapped the French Dinky logo on the ends of the box and used the wrong typeface for the name and number. The illustrations just don't have the same degree of sensitivity and it cannot avoid its uncanny newness. Such details might seem trivial but the lack of authenticity really harshes my mellow for some reason. So now I am displaying the models unboxed - which I find calms the disturbance very well. Al.....thanks for these reviews, even though many of us do not actively the Atlas versions. It is interesting to see what they have brought out, and how well they have done them. I was curious.....on the Guy Lyons Van, how do the wonderful decals on the sides compare to the original ones? That has to be very hard to get right I would think. I just ordered an interesting combination that I saw on eBay; it is the French Dinky Panhard truck in the Kodak livery, paired with a matching trailer. I have always really liked this classic Kodak truck, and often thought how nice it would have been for Dinky to make and offer some matching trailers. So this is satisfying my desire to kind of have a Dinky that should have been, but never was. Of course it is not a real Dinky, but it is as close as I can get! Another trailer I wish they had made would be the Mobilgas, to match the wonderful Foden Mobilgas Tanker.....can you imagine how impressive that would look? Al----One more comment, echoing your thoughts also.......Jan and I both have mentioned that compared to our Dinky Toys, the Atlas models are just about perfect.....paint execution, casting sharpness, lack of flash, etc. But we also feel that something is somehow lost with the perfection, at least in traditional Dinky terms. The Atlas are so good that they sometimes come off as "phony" looking, for want of a better term. But I also realize that many are finding these an attractive alternative to Dinky's, especially rare ones such as the Guy Lyons Van, so I do not criticize those collecting them, but I am certainly not embarking on adding many of these as I am very busy with my original Dinky's. But once in awhile, something like that Kodak combo comes along and I can't resist! Hi Terry, Whatever means Dan and Atlas have of applying decals, the placement is very precise - too accurate to have been applied by hand, I think. From a quality perspective, I suppose it could be argued that the copies are better manufactured than the originals. But they do have the benefit of 60 years of evolution in production methods. The Dan van uses pale yellow instead of gold for the lettering fills. The reduced refraction makes the letters more discernable at a distance. Atlas has opted for gold lettering but failed to use the correct typeface - and even setting the address line in Times rather than a sans serif copperplate. Apart from these silly stumbles, the resemblance remains excellent. No, it cannot be as good as an original in the sense that it reproduces all the manufacturing defects of mid-century mass production - which communicates in a tangible way that human hands have been involved in the crafting of the object - the soul of the thing, for want of a better definition. Atlas and Dan are never going to possess that kind of nostalgia value. But I don't think that necessarily makes them charmless and I like seeing them on the shelf (without the boxes). I should say that I don't even collect Atlas in the way I collect Dinky... they just arrive in the mail and accumulate. Most of them are French models which is good in a way, because I have very little French Dinky anyway and probably never would have done. It will be interesting if Atlas ever do start to make more British Dinky copies - particularly of pre-war castings like delivery vans and 24 series which were so atrociously manufactured that hardly any have survived for anyone to collect. Hi everyone from a springy New Zealand! Firstly, the issue of crimped axle ends - I guess Atlas et al can't offer them due to modern regulations as they are quite sharp on the points. I have been comparing the CIJ (Norev), Atlas and original versions of the 589A Berliet GAK tow truck. The CIJ version is definitely different from the Atlas one as shown in the base casting and the method of painting of the grille etc. For 589A, the CIJ interior is wrong and more like the 589 (red) version with the engine cover moulded in (like the rest of the Berliet GAKs). Meccano changed the moulding when they introduced 589A. In this respect Atlas is accurate although the dashboard top does not extend above the bottom of the windscreen. Does anyone know about the Classic Dinky Vans series which appears to be being piloted starting with the Trojan van in blue Oxo livery? Have not heard any updates on those yet. I've also seen guy flat trucks and foden mobilgas turning up on ebay... so assume the subscription is shipping in a different order in different areas. With the first UK series I queried the sporadic issue and the fact that the item number (the last two numbers shown on the invoice) did not tally with the order in which models were received and was told that it related to what stock they had when a shipment was due. Still never received a 16 nor a 40 (the latter being I think a Simca Versailles). Trucks seems even more irregular. Incidentally there do seem to be various people swapping bits around and adding decals to make Code3s and maybe the foden mobilgas is one? There certainly could be a good amount of code3 out there. To get a tanker back kit as spares cost about £25 from steve flowers but you can pick up a whole atlas esso tanker with tyres and hubs and everything else for a lot less than that right now. The guy flat trucks are probably real because those are shown in the atlas advertising and I've seen several being offered. And at the same time, dan toys have issued a whole galaxy of guy trucks in flavours of every kind. I didn't get a Versailles either, nor a dodge royal or a porsche coupe. I heard there was a problem with the licensing on those models - but most information is suspect because I don't think even atlas knows what's going on most of the time. Another curious development is the appearance of variant colours offered by far east sellers. Three colours of citroen DS, four colours of panhard, three of 23a, three isobloc, etc, etc. I suppose these represent special editions in various territories but foresee that some kind of list is going to be needed. The DS seem to be a set which could be purchased by subscribers, but there seem to be some run outs from HK such as the yellow DS with threaded tyres not smooth. The Panhard was violet, but then then brought out one in yellow with no interiors in a 'prototype' set subscribers could buy. 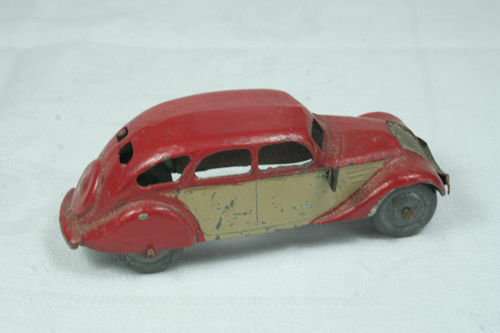 An amended Panhard casting without suicide doors has come out just as Dinky did, as a Dinky Junior and in red I think. The Isobloc was in green, as an Air France 'prototype' and later in red with the striated roof rack, now issued in blue for the UK. I got a Thunderbird in a slightly lighter red, with a brown interior from the French metallic green issue, a DeAgostini marked base and in a Atlas box - does that constitute a run out bitsa or just a Friday afternoon car.........today received the Berliet GAK drinks truck which carries according to the Chinese BLERES. Deagonstini has offered several variations to the Italian market - a red/brown Renault 4L, cream Fiat 600, brown Grande Vue, red Studebaker commander, red/brown interior thunderbird, blue VW beetle with dark blue not spun hubs, red 2cv (24T) with white hubs. So it seems they are offering different variations in different locations. I have a gold Packard with solid black wheels which was a German issue. Atlas Editions Dinky Trucks Collection concluded in December with a rendition of the 934 Leyland Octopus Wagon in blue and yellow. One of the quirks of this company is that you don't know it's over until it's over. So it turns out there were 25 models in total. UK cab castings were used at least twice - the ford TK revisited three times - and the Guy van back four times. A sprinkling of previously released French studies fleshed out the ranks. We hear a further six models had been planned to run the collection into 2018, but this continuation has been scrapped. What happens now is not clear. The initial cars collection has been succeeded by Dinky Toys II - a rehearsal of the Saga des Ouvrants collection already available in France. There has been no intimation of plans for a second truck series. My guess is that Atlas Editions is going to hold back while the parent company DeAgostini runs out its Dinky Collection partwork over the next couple of years. GUY Vixen van "Robertson's" "Spratts"
Almost nobody has noticed that the Atlas Leyland Octopus has different hubs on the front axle from the other three axles. This could have been correct if Atlas had not inverted the wheel types. Quite a few Dinky Supertoys Octopus wagon have been made with plastic hubs on the front axle and Supertoys hubs on the other axles. This was done when the change to plastic hubs was done in June 1962 cf. drawing 7873. The sub assembly ref. 7875 Front bogie was made separately from the truck and included the base plate, the front axle and hubs. Perhaps also the tyres but there is no evidence so far. Aparently, the trucks were made first and when the front bogie had to be made there were no Supertoys hubs left and the new plastic hubs were fitted. Atlas wanted to replicate this feature but they got it wrong and made this wagon with Supertoys hubs at the front and plastic hubs at the rear. See alkeeling's picture above. Two other mistakes found by Ragnar are on the box. • In Sewdish the word tankbil means tanker is is misprinted tonkbil. So after about 60 or 70 years of advances in manufacturing and assembly methods, it's interesting to see how basic mistakes are still possible. Well spotted, Jacques and, no, I hadn't noticed the wrong hubs. Now that the UK Dinky Trucks Collection is over, there is no indication as to whether models like Berliets and Willemes will be made available this side of the channel. And while French customers can buy fills for their collections direct from the Editions Atlas website, there is no such consideration for buyers in other countries where they operate. But perhaps this corporation just wants to give us the authentic flavour of a disorganised disfunctional twentieth century toy maker ?